Ambabai Temple, Kolhapur, Bombay Presidency. bl.uk > Online Gallery Home	> Online exhibitions	> Asia, Pacific and Africa Collections	> Ambabai Temple, Kolhapur, Bombay Presidency. 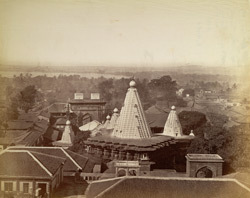 View looking over the rooftops towards the white spires of the Amba Bhai Temple, from the Lee-Warner Collection: 'Bombay Presidency' taken by an unknown photographer in the 1880s. The Amba Bai Temple is the largest of several temples at Kolhapur in Maharashtra, western India. It belongs to the Yadava period and was built from the 10th century onwards, although it has been largely rebuilt. The main portion of the building is built of black stone from local quarries. The sculptures of the temple are set into small niches and the doorways are flanked by pilasters and pierced stone screens. The pyramidal tower was built in the 18th century.